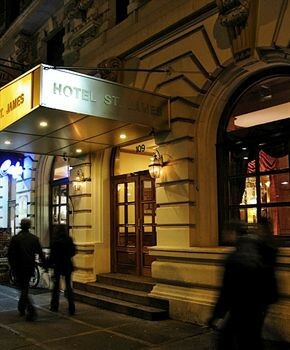 Property Location With a stay at Hotel St. James in New York (Broadway - Times Square), you&apos;ll be minutes from International Center of Photography and Broadway. This hotel is close to Times Square and Rockefeller Center.Rooms Make yourself at home in one of the 144 air-conditioned guestrooms. Complimentary wireless Internet access keeps you connected, and satellite programming is available for your entertainment. Housekeeping is provided daily, and both cribs/infant beds and rollaway/extra beds are available on request.Rec, Spa, Premium Amenities Make use of convenient amenities such as complimentary wireless Internet access, concierge services, and tour/ticket assistance.Dining Grab a bite from a snack bar/deli serving guests of Hotel St. James.Business, Other Amenities Featured amenities include a business center, limo/town car service, and a 24-hour front desk.